The season four finale of The 100 boasted a perfect storytelling gimmick: the doomsday clock. It was an entire episode devoted to a single story, which involved Clarke and the team working against the impending Praimfaya to save their lives. The structure of the episode, which made it clear how much time everyone had to save their lives, worked wonders in terms of tension and unpredictability. The 100 has always managed to shine when it’s delivered an episode that pits its character against some sort of imminent doom, and “Shifting Sands” is no different. With everyone back on Earth, and back to trying to survive while also navigating the tricky landscape of human motivations, loyalty, and deceit, things are really starting to heat up. There’s no doubt that the start to season five managed to set a tone that felt unique for this show. The isolated stories, and the patience shown in reuniting certain characters, added some welcome tension to the first few episodes. Those episodes could have proved sluggish—when will everyone clash again? would have been a reasonable question—but the laser focused character work did all the heavy lifting. The clashes weren’t needed. 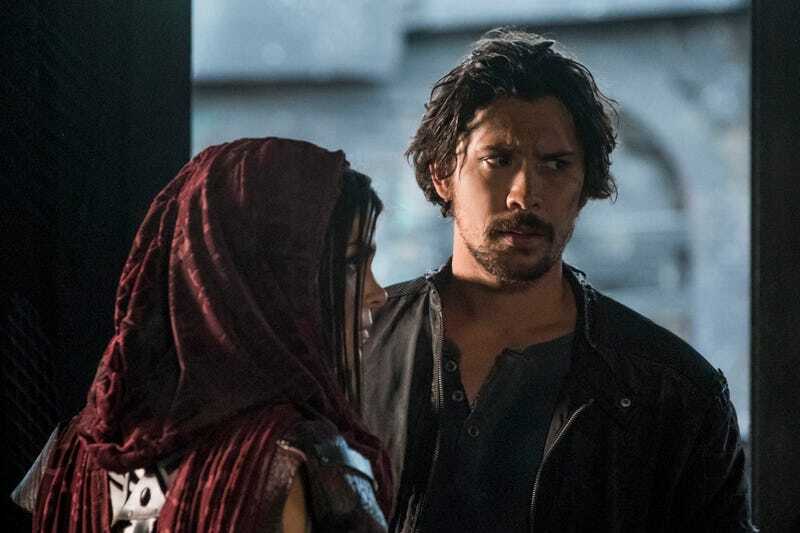 Now though, five episodes in, The 100 is expanding again, and that means that we’re being introduced to new character dynamics, new threats, and a new understanding of how this world will work after Praimfaya and six years of groups only interacting with their own people. It’s fitting that “Shifting Sands” opens with a scene that contrasts beauty with brutality. As Miller sets out to observe Charmaine’s people and the Shallow Valley for Octavia, whose army prepares for war, Jackson pulls him aside and kisses him goodbye. It’s a tender moment, with Miller’s face shrouded by his hood. It should be a vulnerable moment, but that hood suggests otherwise. Not everything is being revealed, as he tries to slink off without engaging Bellamy or Clarke. When he’s forced into conversation, with Clarke making a good point about her knowledge of the area and how valuable it could be on a scouting assignment, the brutality after the beauty becomes apparent. Clarke talks of shards of glass that cut like razorblades out in the desert, a bit of bloody business before any army even comes in contact with its enemies. Now that all of the season’s major players are back in the same spot, the true fireworks can begin, and “Shifting Sands” wastes no time setting the stakes real high. The doomsday clock I mentioned above refers to the storytelling structure of this episode, which pits Octavia’s need to survive against an impending attack from Charmaine. Octavia is trying to go on the offensive and take the Shallow Valley, but Charmaine is watching from the ship. She’s prepared to blow them all to smithereens if she can get the missile system back online, and that lends the episode its intensity. As if that wasn’t enough, The 100 also introduces a new threat. Miller and his scouting partner race back from their assignment, the unnamed partner screaming to the high heavens. As Clarke steps in to medically assist him, she realizes there’s only so much she can do with something she doesn’t understand. The man’s stomach twists and turns, and there’s clearly something inside of him. Later, worms come blasting out of his stomach Alien style, briefly infecting Octavia. Grounders, prisoners from space, and sandstorms apparently weren’t enough. Now everyone has to worry about sand worms invading their body. It’s gory, brutal stuff, but it serves a purpose. This is The 100 once again expanding its universe, bringing in other threats to bolster the story of separate clans going to war. That’s a rather familiar story, and the inclusion of an unexplained threat is more than welcome. There are enough wrinkles elsewhere though to make this story different. What’s remarkable about “Shifting Sands,” and is a direct result of the patient storytelling of the first few episodes, is the way the characters feel truly changed. Clarke notes that Bellamy has become a better person in the years since she saved his life, but it’s more than that bit of obvious dialogue. The idea of change is inherent in moments like Octavia saying that “love is weakness,” only to be rebuked by Indra, formerly the hardest warrior of all. “I love you. Does that make me weak?” she says, to which Octavia can offer no substantial reply. It’s in Kane’s need to take care of Abby, and in Murphy’s insistence on sacrificing himself for the greater good too. More than anything though, it’s in Octavia’s need to be a leader above all else. In the six years she spent in the bunker, she had to learn to survive at all costs. Now, she doesn’t have to bear that weight, but she simply can’t step away from it. She still believes these people need a ruthless leader. Maybe she’s right, but the return of Clarke and Bellamy, and the episode-ending reunion with Harper, Monty, and the others suggests that she’s not alone anymore. What Octavia is missing is this: her, Clarke, Raven, Bellamy, and all the others didn’t survive because of a single leader, but because of their ability to come together as a community. It’s a lesson that she doesn’t seem keen on remembering. Apparently the Eligius crew has only been in Shallow Valley for a bit, and they’re already living their best life, complete with heavy metal and lifting weights. Rock on, space criminals. Abby discovers that many (all?) of the prisoners on Eligius have brains infected with something, and it’s all because of what they were mining. Unions are important, people! Indra pushing back against Octavia’s cold “love is weakness” line is the highlight of the episode for me, though there’s plenty to choose from. “I can take care of you. I know what to do.” Kane is doing everything he can to get Abby off her pills, but Charmaine isn’t helping in the slightest. We all remember our first tequila shot, Kane.